Protect your pictures and organize them with this 1,600-Photo Organizer Case. It comes with 16 acid-free photo cases with rounded corners that help keep images looking their best for years to come. Each inner case can hold one hundred 4" x 6" photos. Outer case has a sturdy handle for easy transport and a stackable surface so you can order more than one to hold your entire photo collection in a small amount of space. Hinges and snap closures on all cases keep photos secure. 15" x 12" x 5". Polypropylene. 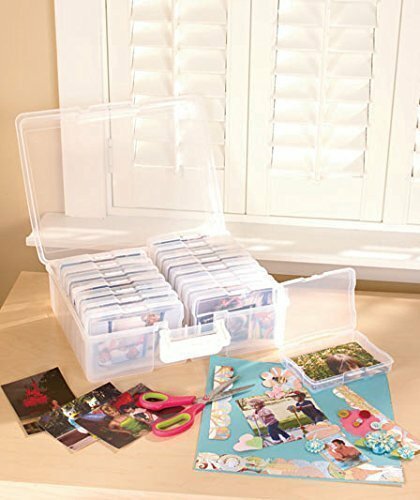 Protect your pictures or cards and organize them with this1,600-Photo Organizer Case. If you have any questions about this product by Scrapbooking Photo Organizers, contact us by completing and submitting the form below. If you are looking for a specif part number, please include it with your message.